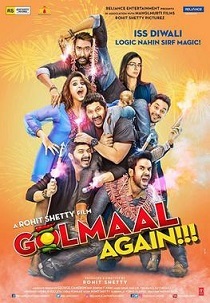 Review Summary: 'Golmaal Again' is entertaining and spirited. A great mindless Diwali entertainer! Wanna bet it’s on the way? Meanwhile, because so little of it feels fresh or original, I’m going with two out of five for Golmaal Again. While Gopal and Laxman (Shreyas) were together, Madhav, Lucky (who can’t speak) and the other Laxman (Kunal) stayed together. Rohit Shetty uses his trademark slapstick comedy sparsely and mainly relies on the supernatural elements to make things look funny in this Ajay Devgn-starrer.